It is no secret that bee populations in the world are under threat and quite literally, without our bees, we will be under threat too. We could all take a leaf out of Paris’ book. Paris has become known the apiarist capital of the world. 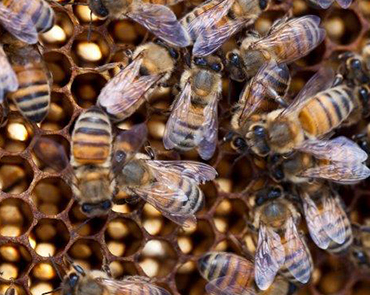 The queen bee of all cities as 10 years ago it declared itself a pesticide-free zone. As a result, their bee population has exploded. In fact, because of the wide variety of flowers to choose from in the urban landscape, the Paris apiarists are finding that their bee colonies are doing better than their rural counterparts. This is due to as few factors- the spray-free environment, the warmer city climate, and the wider choice of plant varieties for the bees to choose from. A brave trail-blazing move but surely attainable here in Australia? There is lots we can do in our own gardens. Bees fly up to 5kms from their hives in search of nectar and pollen so if your garden is looking beautiful and your veggies producing well, chances are you have a hive somewhere nearby. It is really in all our best interests to ditch the sprays and to plant bee and insect friendly gardens. I try to plant a wide variety of flowers that bloom at different times of the year so that the bees get a varied diet. In my garden, I find the bees love the herbs especially lavender, marjoram, parsley, rosemary, and thyme. Luckily, I love those too. They love all my fruit trees- lemon, mandarin, apple, plum, lime, passionfruit, and apple. They do work in the olive grove but prefer the jarrah, banksias, eucalypts, grevilleas, and tagasaste. They work tirelessly in the veggie patch no matter what I plant. My garden flowers are mostly native, but I try to plant a variety of annuals just to keep things colourful and interesting. If you want a more scientific list, try the AgriFutures Australia website for Bee Friendly planting.